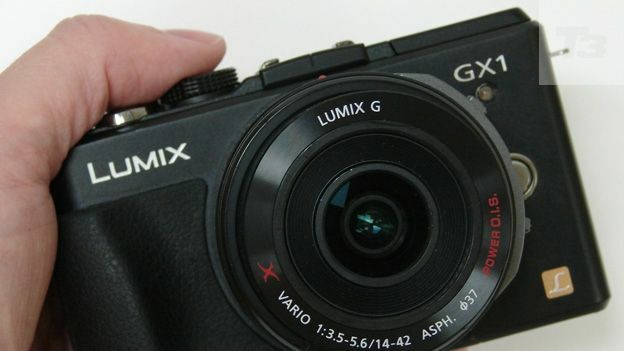 Does the range-topping Panasonic Lumix DMC-GX1 have the ‘X’ factor? The Panasonic GX1 is the brand's first enthusiast targeted 'X' series Micro Four Thirds interchangeable lens camera. But can it hold its own against existing rivals? Panasonic was the first manufacturer to introduce a compact digital camera upon which the lens could be unscrewed and swapped, as on a SLR. But that was September 2009, and since then every camera manufacturer of note, apart from Canon, has also introduced what has become known as a Compact System Camera, or 'CSC'. The appeal is obvious; image quality practically on a par with an SLR, but less bulk. Into this increasingly competitive marketplace, with its myriad non-compatible systems, Panasonic recently launched the 16 megapixel Panasonic Lumix DMC-GX1 or Panasonic GX1, for short. It's the first of what it says is a new 'X' series of compact cameras aimed at the photo enthusiast looking to achieve professional-looking shots, though it maintains the Micro Four Thirds sensor and mount configuration of its predecessors. Though no bad thing it's not as revolutionary as it might like to suggest, being handling-wise an obvious follow-on from the previous GF1 and GF2 models. The Panasonic GF3 remains current, although that's been pitched at the mass market with its pared-down features and more obviously automatic functionality. Available in black or 'Aston Martin' silver-grey, the Panasonic GX1 goes to bat against the best of the competition, which currently comprises the Olympus E-P3, Nikon V1 and Sony NEX-7 at the top end, all very good options in their own right, if slightly more expensive. So does Panasonic's GX1 pack in enough features to satisfy the photo junkie while offering a reasonable priced alternative into the bargain? With its lightweight yet substantial feeling aluminium frame, comfortably curved handgrip with leather–effect rubber padding to the front, plus stereo microphones and vacant hotshoe for an optional flashgun or LVF2 electronic viewfinder (EVF) on the top plate, the Panasonic GX1 looks the part. It's boxier than the Panasonic GF3 yet not unattractive. Unlike say the Nikon V1 and Sony NEX-7 then, an EVF isn't built in – and if you did want to add one to the package, at £200 it would even the price differential. As it is we're 'stuck' with the Panasonic's LCD at the back, which doubles up as a touch screen. The touch panel here works in tandem with, rather than as an alternative to, the small metal buttons located to its right. In this respect it unthreateningly recalls Panasonic's point-and-shoot Lumix compacts, though we do get dedicated DSLR-like buttons for locking focus and exposure and swapping between auto and manual, alongside time-saving features like a Q.Menu (Quick Menu) button, plus 'intelligent Auto' for reliable point and shoot operation. We were pleased to additionally get a chunky physical shooting mode dial with manual and customisable settings, alongside a large and obvious shutter release button plus separate video record button. So there's no need to hunt around to find the essentials on this camera, as you might do with a more minimalist Sony NEX. We were supplied the GX1 body with the new premium priced 14-42mm 'power zoom' from the X-series. This provides a focal range the equivalent of 28-84mm in 35mm terms. But unusually, it has a built-in control lever for zooming in or out. This has advantages and disadvantages. First off, it maintains a slim pancake lens-type profile when attached to the camera and in its dormant, retracted state. Secondly, the beauty of the motor driven lens is that users don't need to manually unfurl it before taking a shot, as with the equivalent kit lens supplied with Olympus Pen cameras. But then again you can't simply twist the barrel left or right to arrive at the framing you want. The price for the camera and this lens is £729.99, or a more reasonable £499 if you've owned an older Panasonic Micro Four Thirds camera and require just the camera body only. The fact that the GX1's LCD offers touch sensitive icons – such as a delete trashcan in playback mode – means that the screen here provides an alternative method of controlling the camera; not just purely a means of composing and reviewing pictures in the absence of a built-in optical or electronic viewfinder. Otherwise the fixed – i.e non-angle adjustable – screen is the regular 3-inches in size and offers a middle-of-the-range resolution of 460k dots (as opposed to say, 921k dots). While this is adequate for assessing whether a shot is properly focused or not before downloading it, visibility is aided by a wide viewing angle and choice of seven brightness adjustment levels. The Panasonic Lumix DMC-GX1 packs a DMW-BLD10E lithium ion rechargeable battery in the base of its handgrip, shared with a slot for all variants of removable SD card media (SD, SDHC SDXC). This provides sufficient power to shoot around 300 to 310 photos, which is a performance on a par with the average snapshot camera rather than a DSLR. Sufficient juice for that weekend away at least – though we'd want to pack the supplied mains charger if we were away for longer. With the camera powering up from cold in just over a second, Panasonic is making a point of plugging the swiftness of the GX1's auto focus (AF) mechanism – here zeroing in on a subject in just 0.09 seconds if used with the 14-42mm zoom. Squeeze the shutter release halfway and response time is indeed blink and you'd miss it swift; AF point/s highlighted in green with a bleep of affirmation that the user can go ahead and take the shot. What this means in real terms is that if you see the possibility of an image in your mind's eye before squeezing the button, you're not likely to miss it. Panasonic has also included a funky on-screen level gauge here, to assist in straight and level horizons even when you're not using a tripod. Couple this with the provided lens and the result is crisp and colourful results, even if they're inevitably a little soft compared with an actual digital SLR, due to not only the smaller glass here but also the smaller sensor. For low light shooting the GX1 offers the advantage of an ISO range topping out at an impressive ISO12800. Up to and including ISO1600, results are commendably low on noise/grain, though from ISO3200 upwards this is readily visible in the shadow areas, with ISO12800 both grainy and soft, though usable at a push in those circumstances where a shot might not otherwise be attempted – such as if shooting a gig. For the same, here 1920x1080 pixels Full HD video in a choice of highly compressed AVCHD or more widely compatible MPEG4 formats gets its own record button and a respectably smooth frame rate of 30fps, while the mechanical lens mechanism ensures zoom transitions are slow and steady. Overall results are up there with a premium priced fixed lens compact, such as the Panasonic LX5 for example, yet here there is more option for expandability, including the opportunity to attach its maker's 3D lens if that is a direction you'd like to explore. If you want the twin benefits of a compact camera body plus the ability to swap lenses and drill down into manual features to achieve more professional looking pictures, the Panasonic GX1 is currently the brand's best option. While not cheap if you're buying the top-of-the-range lens we used on test as well as the body, another option is to go for a regular non-mechanised 14-42mm lens, which brings the price down to a suggested £599. For such an outlay the GX1 is looking a steal compared with the Olympus E-P3, Nikon V1 and Sony NEX-7, if it doesn't quite dislodge the Sony as our current king of the CSC's for picture quality. Still, we did manage to squeeze the GX1 with supplied lens into a jacket pocket, which isn't always the case with so-called micro system cameras. Panasonic GX1 price: £729 with supplied 14-42mm 'X' series Power Zoom, £599 with regular 14-42mm kit zoom, or £499 body only.